The Norfolk Admirals…..well a new look Norfolk Admirals played a strong game against the Charlotte Checkers tonight at Scope. 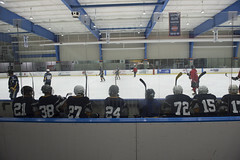 This was the second and final game of the preseason for the Admirals. Norfolk lost game one Friday down in Charlotte. One familiar face, Chris Wagner, had a strong game finishing the game with a goal and an assist. John Gibson made his appearance in net and played a solid game and got the win. Anaheim is getting ready to close out training camp and make their final cuts. The team Norfolk put on the ice tonight can look very different come opening night. NORFOLK, VA –Chris Wagner finished with a goal and assist to lift the Norfolk Admirals to a 4-3 win over the Charlotte Checkers in a preseason game at Norfolk Scope Saturday evening. 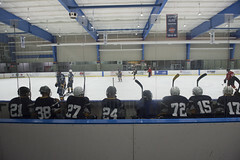 The Admirals struck first at 8:34 of the opening frame as John Mitchell snapped a shot from the high slot which ripped past the shoulder of Charlotte goaltender Mike Murphy to give Norfolk the 1-0 advantage. Nearly six minutes later, Kevin Gagne lit the lamp on the power play, extending the Admirals lead by two. It took just 48 seconds for the Admirals to add to their lead in the second. Charlotte goaltender Mike Murphy turned the puck over from behind his own net, and it was taken away by Admirals forward Max Friberg. Friberg carried the puck to the right side of the goal and slid a cross-crease feed to Chris Wagner who buried the puck into the net on the backside to give Norfolk a 3-0 advantage. Moments later, Charlotte had a great opportunity to get on the board with a 5-on-3 power play, but the Norfolk penalty kill was up to the task and killed off both penalties. The Checkers finally got on the board at 8:27 of the second period. When Victor Rask rushed into the zone and took a feed from Austin Levi. Rask wristed a shot past Admirals netminder John Gibson to put the score at 3-1. Norfolk took a 4-1 lead into the second intermission on a goal by Joseph Cramarossa at 18:33 of the middle period. 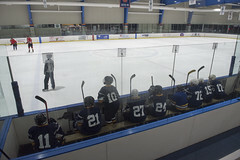 Charlotte made a game of it in early in the third, as Nicholas Blanchard picked up a rebound off a Sean Dolan shot and flipped it past an outstretched Gibson to pull the Checkers within two. The Checkers pulled within one at 12:44, as Justin Shugg picked up a loose puck at the of the crease and backhanded it past Gibson to cut the Admirals lead to one. Despite the late charge, the Admirals held of the Checkers in the final seven minutes to preserve the 4-3 victory. Gibson earned the win stopping 25 of 28 shots, while Murphy takes the loss allowing four goals on 34 shots faced. The 25th season of Admirals hockey opens on October 5 at Hartford. The Admirals home opener will take place on Friday, October 11 at 7:30 p.m. against the Binghamton Senators. single game tickets are now on sale! Game tickets are available through the Norfolk Scope Box Office, all Ticketmaster Outlets, charge-by-phone at 1-800-745-3000 and online at ticketmaster.com.